It’s another match-three puzzle game! Relying on a sense of absurdity that’s in line with the bulk of their releases regardless of medium, Adult Swim Games’ Monsters Ate My Condo is a fast-paced puzzle game that’s worth a look. 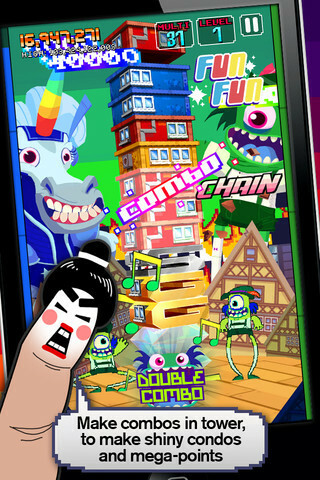 The game was developed by PikPok, a developer of smartphone and tablet games, and originally released onto Apple’s App Store in 2011. It was just recently released for Android devices. As they fell from the heavens, I had to match three or more of the same colored condos to remove them from the growing, ever toppling tower of condos. I had to manage the increasing amount of condos and prevent the tower from falling over while appeasing the monsters on either side of it. If need be, I could swipe condos to monsters to make room and try to get a combo, but if I fed a monster too many condos of an opposing color, I ran the risk of upsetting the monster too much, at which point it’d break and destroy the tower, ending the game. 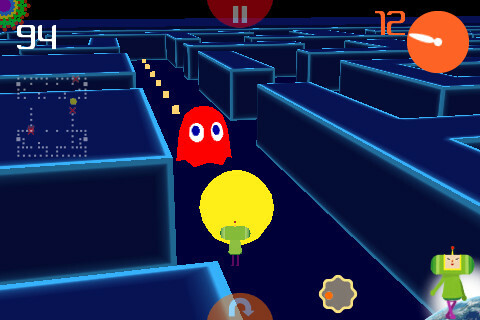 Besides just appeasing the monsters, I could utilize their special abilities in an effort to increase my score. Along with the special abilities of the monsters, I could try and create chains of combos to reach for a high score. When I created a chain, special blocks of bronze, silver, gold, and eventually diamond constructions remained, that when matched, produced big points. Although my management of the tower and the monsters was my focus, scoring big points was the name of the game. 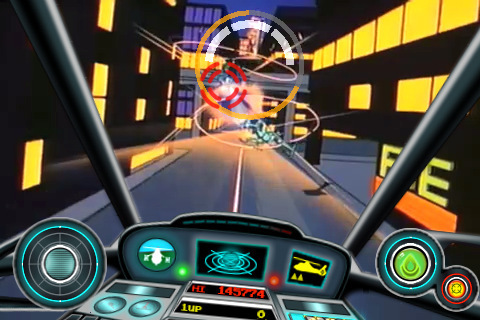 In both the endless mode and the time attack mode, scoring as many points as possible was the goal. My management of the tower and the monsters became tougher the longer a session would go on. As my high score climbed, so too did the tower; it’d be able to hold more condos and the condos began coming in more colors and types. The longer a gameplay session lasted, the more ridiculous it became. The screen was full of nonsense in line with the Japanese monster movie vibe along with point totals and multipliers that were constantly flying around. Again, what the finger says. 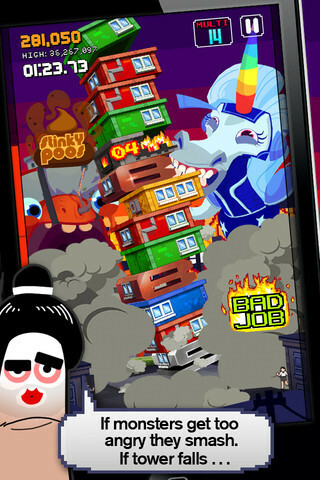 Monsters Ate My Condo is a visually striking game that was quick to captivate and worth every bit of the dollar it costs. 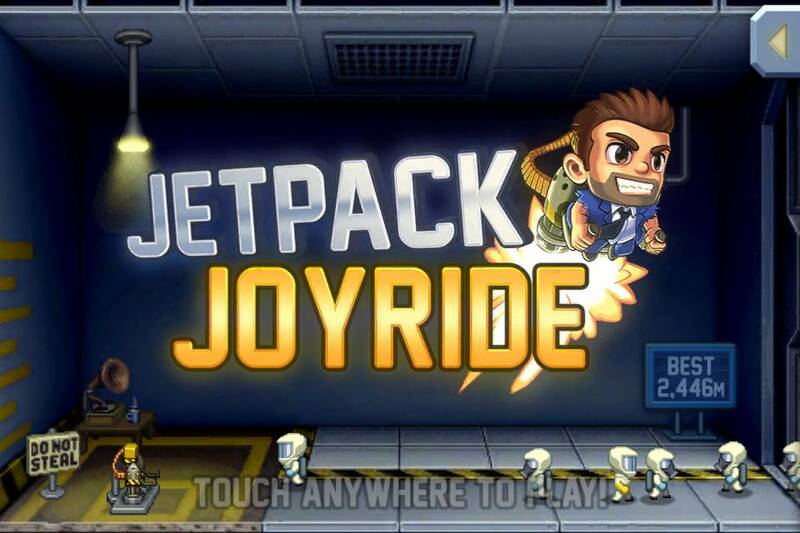 My iPod has been host to more of my gaming time recently and one of the reasons is Jetpack Joyride. This free game was developed by Halfbrick Studios and released last year. But before discussing the game, I want to address the Australian studio’s dramatic rise to prominence. Founded in 2001, they spent eight years as a contract developer, mostly focusing on Nickelodeon properties. In 2009 they released their first original game and the following year they released Fruit Ninja. This was unbeknownst to me. It’s hard to believe that the studio responsible for one of the most popular games in recent years spent nearly a decade toiling on handheld versions of children’s properties. They’re the video game equivalent of a long-time musician who never “made it” writing a song that becomes a hit. 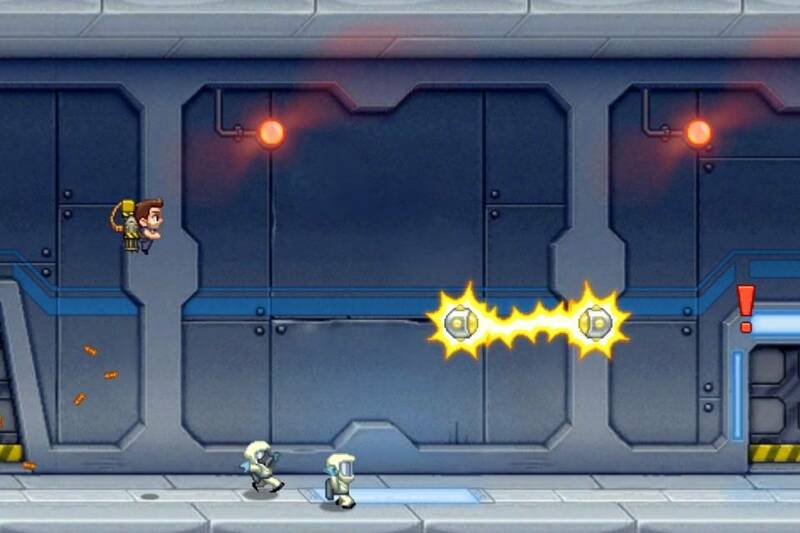 … because the jetpack has a machine gun attached to it. Okay, onto Jetpack Joyride. Each game begins with Barry Steakfries busting through a laboratory wall with a pilfered jetpack. If there was a goal to the game, it’s simply to fly as far as you can and beat your personal high score. What keeps me coming back and not wanting to put it down though is the multitude of short-term objectives. Players always have three missions that they’re working on. When completed, they’re rewarded with level ups and money. The missions weren’t tough; they mostly required dedication. This made them especially alluring because I’d often think I could complete at least one before doing something else. Earned money could be spent on gadgets, costumes, and a mix of other items and the store itself is tiered so better items are unavailable until a specific number of lower tier items have been bought. There were a few other vehicles, including the Crazy Freakin’ Teleporter. As was the case with Thomas Screiber’s Slayin’, I feel that Halfbrick Studios was able to infuse a lot of character into a small package. 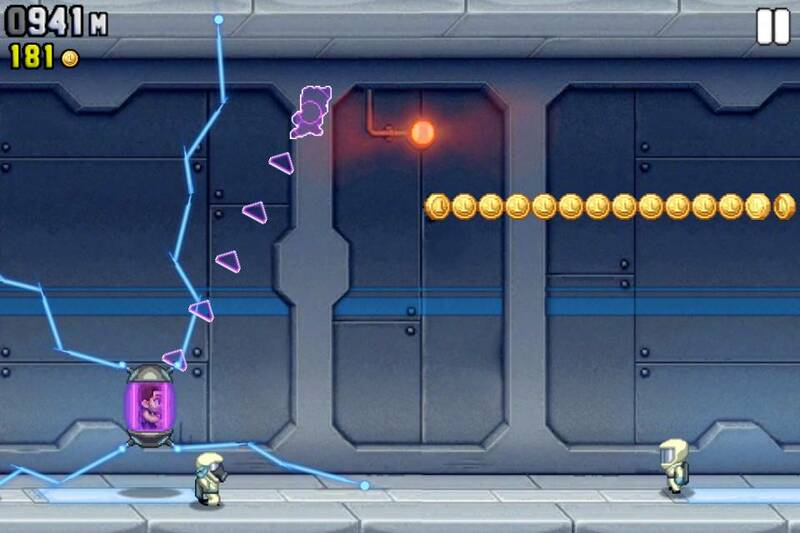 The art direction and the in-game text were great, but the best part about Jetpack Joyride was its short-term reward system. I always had something to focus on, be it a new high score, completing a mission, or trying to unlock an item from the store and this system of short-term gratification kept me playing and playing and playing. Cobra Command’s opening theme song is fantastic. When I picked up my iPod today, I discovered that the world has been in a state of chaos thanks to a group of terrorists. Without a force for good, anything can happen, so I decided to join cobra command. 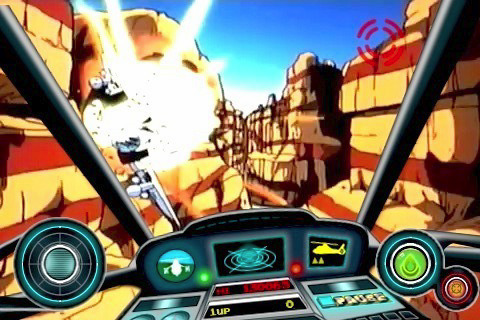 The task force is comprised of elite helicopter pilots and a network of necessary support staff and is the focus of the video game, Cobra Command. Originally released as an arcade game in 1984, it was developed by Data East and thanks to Revolutionary Concepts, it’s playable on iOS devices. 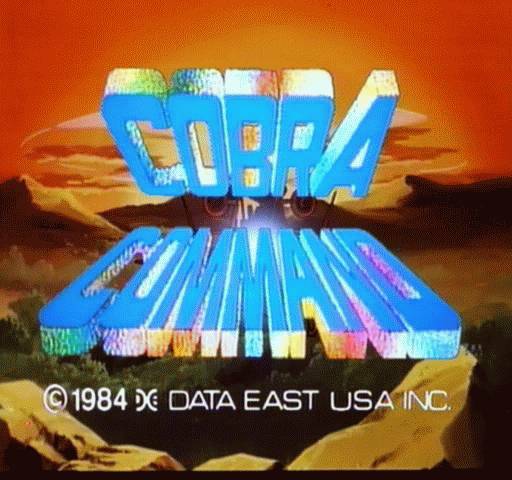 Cobra Command is a combination of Saturday morning cartoons and action-based video games. Instead of graphics composed of pixels or polygons, the game is an animated cartoon. Like the Saturday morning cartoons from the 1980s, some of the drawing, animation, and transitions are imprecise. However, the fact that it’s hand drawn is impressive and this style sets it apart from other games. The terrorists are attacking worldwide and a player’s tour of duty takes them to the Grand Canyon, New York City, jungles, and many other locations. The terrorist’s primary weapons are also helicopters and shooting them down requires pinpoint accuracy and swift timing. As my helicopter flew on its predetermined path, I would wait for an indicator to pop up on my foes, at which point I would shoot them and hope I destroyed them before a timer ran out. If I didn’t, I’d have to restart from the previous checkpoint. I found the game to be very hard at first, but when I turned the difficulty down to easy, I blew through Cobra Command. On easy, I didn’t have to manually take sharp turns by utilizing my iPod’s accelerometer as much as before, and the timing required to shoot down my foes seemed more lenient. Still, deaths often felt cheap and to succeed I had to rely heavily on memorization and quick reflexes. On harder difficulties, helicopters are only susceptible to machine guns and other vehicles only to missiles. Games like Cobra Command don’t get made often anymore and for good reason. Building a game around a cartoon or any predetermined video limits how a player can interact, and developer’s implementations almost always rely heavily on memorization and quick reflexes. These aren’t negative traits, but they can lead to frustration quickly. Unless you have a sweet spot for games like this, I’d avoid enrolling in cobra command. The Katamari games always have a vibrant art style and out-there soundtrack. They're very fun games to experience. A new game in the Katamari series has been released this week. The newest title, Katamari Amore doesn’t bring anything new to the series, but according to some, it’s an improvement over the last iOS Katamari game, I Love Katamari. The main criticism of I Love Katamari was the game’s reliance on tilt controls. It seems the major complaint was the responsiveness, or lack thereof. I haven’t played I Love Katamari but I can imagine how tilt controls would be a pain. 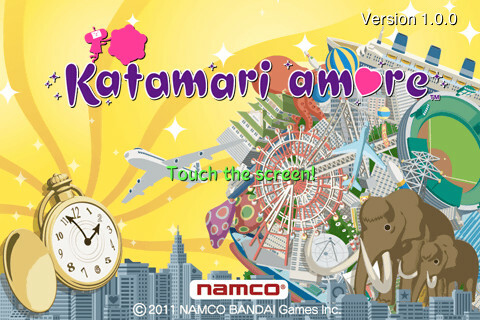 Katamari Amore still has the tilt controls, but the default option is to play with a virtual joystick on the screen. This method worked fairly well; I didn’t feel like I had great control, I had a difficult time making sharp turns, but this probably works way better than strictly tilt controls. My major complaint is the camera. I wish I could control the camera via a second virtual joystick on the right side of the screen, but there’s no camera control at all. The camera sticks behind the prince and slowly changes as he turns. It was adequate but not ideal. I didn't see it myself, but this Pac-Man stage could be very cool. I’m not sure how much of the content in Katamari Amore is new and what is rehashed, but for a paltry four dollars, it’s probably a solid game to have in a pinch. Even if the controls weren’t perfect, they did an adequate job of translating my actions to the prince. The man at the game's title screen, The Archetype, makes me question much about the game's setting. 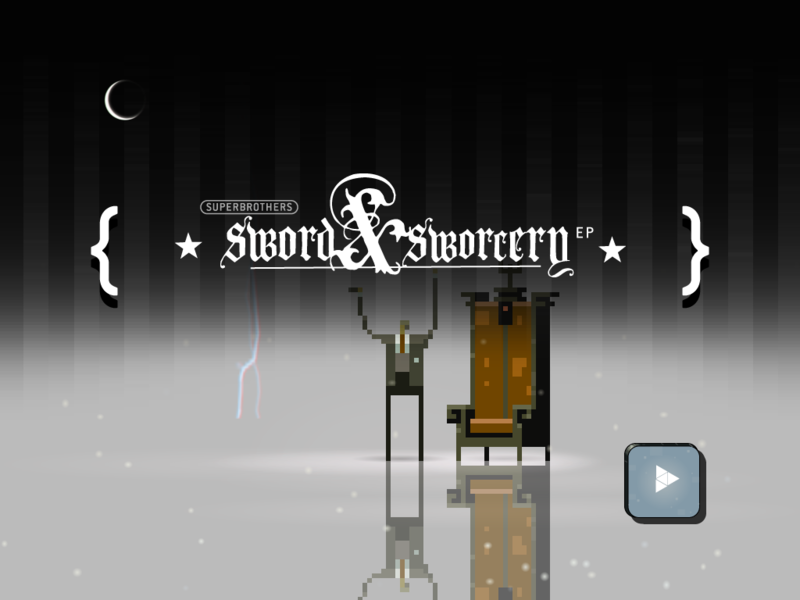 Superbrothers: Sword & Sworcery EP is a downloadable adventure game for iOS devices. There are two versions, one specifically for the iPad and another that works on the iPhone and the iPod Touch. It was developed by Capybara Games; art was done by Superbrothers, and special mention was given to the musical stylings of Jim Guthrie. The two versions were released in March and April of this year, respectively. While infrequent, the battles, specifically the boss battles, made me stop playing in frustration. Superbrothers is a point and click adventure game. To move my character (The Scythian), I clicked where I wanted her to go and she went there. Alternatively I could hold my finger on the screen and drag to where I wanted her to go. I played the game on my iPod Touch, and I wasn’t really that happy with the size of the screen. Then again, I don’t have a past with point and click adventure games, so this was sort of a new experience for me. I explored my surroundings and tried to figure out what was going on and what I had to do. The Scythian wasn’t all brain however. 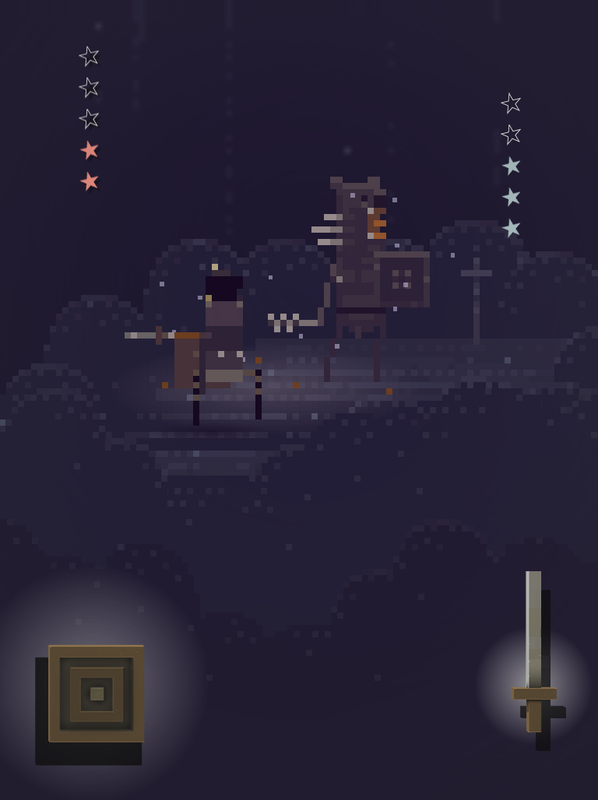 Occasionally as I explored, I’d run into enemies and have to fight them. Normally I’d hold the iPod in landscape mode, but whenever I had to fight I’d have to stand the iPod upright. During fights, icons of a sword and a shield would appear in the bottom right of the screen. Battles were infrequent, but battling the bosses became tedious. The bosses attacked in mostly the same way and a lot of these fights required precise timing swinging my sword; easier said than done. The game is broken down into sessions. My first session lasted about thirty minutes and it introduced me to the character I controlled, The Scythian, my surroundings, apparently the Caucasus Mountains in Eurasia, and my quest. After a bit of walking I ran into a couple of people. One of them, Logfella (voiced by Robert Ashley!) led me to Mingi Taw, where I found the Megatome. For one reason or another, the Megatome is what the Scythian was after. After it was removed however, a deathless spectre awoke and I had to find a way to deal with it. The art style for Superbrothers was very interesting. I usually don’t like games that use a darker palette, but the pixel-like design of Superbrothers drew me in. The mystery behind the story also drew me in. I was perplexed by the quest The Scythian was on and the hipster dialogue kept me questioning the time period the game was set in. The objectives I accomplished were conceptually very interesting, but the actual gameplay I had to go through was oftentimes not ideal. I enjoyed everything but the gameplay in Superbrothers and for a couple of bucks, that’s a good deal, even if I didn’t beat it.